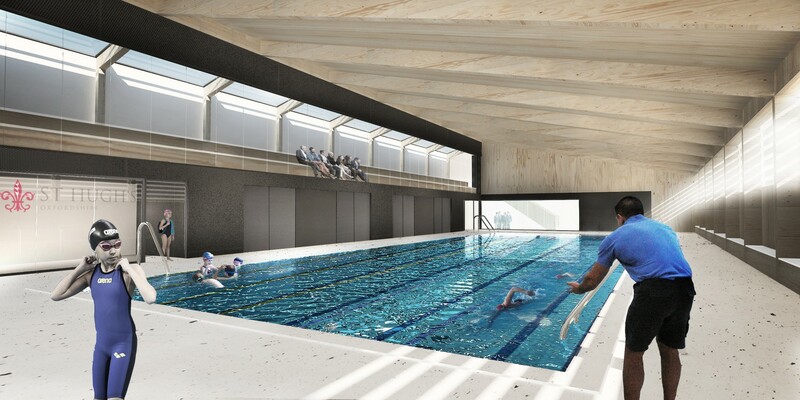 Invited competition entry for a project to provide new sports facilites – comprising new changing facilites, swimming pool and upgrading of the existing sports hall fabric & environmental systems. To minimise the impact of the new development on the immediate setting of the grade II listed Manor House that forms the central focus to the school, the new facilities are proposed to be located within the existing Walled Garden and to be partly sunken into the garden. Conceptually the changing facilities will read as part of the Sports Complex, clearly subservient to the Manor House and associated buildings. The facilities are organised around a new east-west circulation axis, incorporating a new quadrangle, serving and unifying the new sports facilities and permitting classroom expansion within the walled garden, while connected to the rest of the school via an existing gated opening in the garden wall. Proposals for phasing, off-site prefabrication & fast-track construction ensure safety and that disruption is minimised during the construction phase.